Pete is Of Counsel with Calcagni & Kanefsky. He is a seasoned litigator who draws on his extensive background in private practice and his federal and state prosecutorial experience. Pete focuses his practice on white-collar criminal matters. He also represents whistleblowers related to all types of government fraud, with particular attention to the healthcare and financial industries. Pete has extensive experience conducting internal investigations and providing monitoring services arising from fraud, waste, abuse, and corruption allegations. Prior to joining Calcagni & Kanefsky, Pete was a partner with a prominent criminal defense firm, representing clients in the areas of healthcare and financial fraud, including securities, bank, mortgage, wire, and mail fraud. 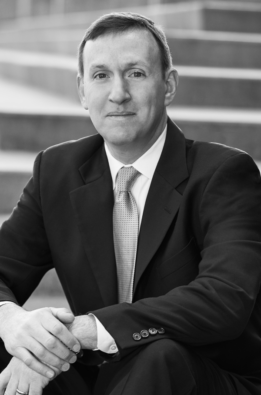 Before moving to private practice, Pete served as a Trial Attorney with the U.S. Department of Justice, Fraud Section, where he focused on complex white-collar cases and supervised teams on the Health Care Fraud Strike Force. Pete served for nearly a decade as an Assistant U.S. Attorney for both the District of New Jersey and the Eastern District of New York, where he led investigations and prosecutions related to healthcare, bank, tax, wire, mail, and insurance fraud. Pete also prosecuted matters involving money laundering, bank robbery, narcotics, and weapons trafficking conspiracies, as well as RICO, capital murder, public corruption, and obstruction of justice. Pete began his legal career as an Assistant District Attorney with the Manhattan District Attorney’s Office. For eight years, he handled varied prosecutions with the Homicide Investigation Unit and the Asian Gang Unit. Pete also served as a Principal at the Berkeley Research Group, where he provided strategic litigation support advice to various public and private clients. Defended a multi-million dollar securities investor against federal criminal and civil charges brought by the Securities Exchange Commission and U.S. Attorney’s Office, Southern District of New York, for securities fraud and perjury, resulting in a dramatically reduced sentence. Represented an individual charged by the FBI in a multi-count computer hacking / international fraud, securing a substantially-downgraded misdemeanor charge and non-jail sentence. Represented a pharmacist in $7 million criminal health care and tax fraud case brought by the FBI, U.S. Department of Health and Human Services – Office of Inspector General, and the U.S. Attorney’s Office, Eastern District of New York. Represented witness/employee in connection with a multi-million dollar international money laundering investigation conducted by the FBI and the U.S. Attorney’s Office, Eastern District of New York. Defended Saudi Arabian national in a series of forgery and false document allegations brought by the New York City Police Department and Manhattan District Attorney’s Office. Represented whistleblower/relator in $150 million foreign exchange currency fraud investigation conducted by the Commodity Futures Trading Commission and U.S. Attorney’s Office, Eastern District of New York. Declared an expert on healthcare fraud investigation techniques in defense of licensed healthcare provider in a criminal trial in California Superior Court. Serves as compliance counsel to a physician and his telemedicine practice. Representing seafood company employees in an environmental crime investigation conducted by the National Oceanic and Atmospheric Administration and U.S. Department of Justice, Environmental Crimes Section. Secured a non-prosecution agreement for a licensed securities professional who was the target of a criminal investigation and prosecution by the SEC and U.S. Attorney’s Office, Southern District of New York. Successfully defended owner of a multi-million dollar real estate asset against forfeiture allegations by the FBI, IRS, and U.S. Attorney’s Office, Eastern District of New York. Represented whistleblowers/relators in $40 million tax fraud investigation conducted by the IRS and New York Attorney General. Represented whistleblowers/relators in multi-million dollar Medicaid fraud investigation conducted by the U.S. Department of Health and Human Services – Office of Inspector General and the U.S. Attorney’s Office, Eastern District of Pennsylvania. Representing a former Department of Defense contract specialist in connection with bribery and kickback charges brought by the U.S. Department of Defense – Criminal Investigative Services and the U.S. Attorney’s Office, District of New Jersey. Pete is a dedicated member of his Cranberry, NJ community, and in 2017, was elected to serve on the District’s School Board. Pete maintains an adjunct professor appointment at both Rutgers Law School – Camden, and at Rider University. He teaches upper-level courses on Health Care Fraud and Abuse, White Collar and Corporate Crime, Criminal Justice, and Rights of the Accused. Pete is a member of the American Bar Association, the American Health Lawyers Association, the Eastern District of New York Alumni Association, the District of New Jersey Alumni Association, and is a Hogan-Morgenthau Associate.